1 What is a credit report? 2 What kind of information is on my credit report? 3 How do I get my free annual credit report? 4 How do I order a free credit report? 6 Can I get a free credit score too? 7 Can I get more than one free credit report per year? 8 How can I dispute inaccurate information on my credit report? Most people already know what a credit report is, but let’s go over the basics real quick just in case. Credit reports are sometimes referred to as “credit files” or “credit history”. They are compiled by the three major credit reporting agencies, aka credit bureaus: Equifax, Experian, and TransUnion. Credit reports include information such as your name, social security number, current and previous addresses, current and former employers, credit card and loan payments, credit inquiries, collection accounts and public records such as bankruptcies, judgments, foreclosures and tax liens. Each account listed on your credit report will show the date the account was established, your payment history, credit limit, and the type of account (mortgage, installment, revolving, collection), etc. Your free annual credit report contains the same information that is found on a paid credit report: your open and closed financial accounts, and your payment history for each. You’ll generally find payment history for loans, credit cards, and revolving lines of credit. You may also see rental payments if you rent an apartment. 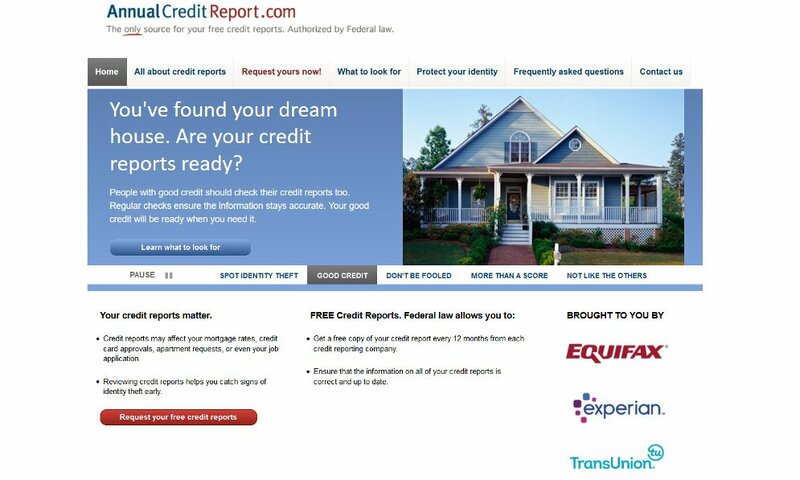 If you are getting your free annual credit report, you can order them online through AnnualCreditReport.com. This website will let you order all three of your free credit reports at once, with no obligations and no hidden fees. You may have to provide some personal information in order to confirm your identity before ordering, but you will not be charged if you use this site. Please note that if you use this free credit report to file a dispute with the credit bureaus, they have 45 days to investigate your dispute instead of the typical 30-day timeframe. The free annual credit report is available to everyone in the United States, but in addition to that, you can also get a free credit report directly from a credit bureau if you’ve been denied credit. You have 60 days from the time you are notified of the denial to request your report. Your request must also be with the credit bureau that was used to check your credit. If you are ordering a free state report, or you are getting a free report due to any of the other factors we’ve talked about, you’ll need to contact the credit bureaus directly. Equifax and TransUnion make it easy to order these free reports online but to get your free Experian credit report you may need to call. Free Experian Credit Report – call 1 866 200 6020 to confirm eligibility and get your report by mail or use this link. Free Equifax Credit Report – order online through this link. Free TransUnion Credit Report – order online through this link. Remember: Keep track of when you order your reports and from which bureau(s) so that you know when you’ll be eligible to order your next credit report for free. Can I get a free credit score too? Unfortunately, the law does not mandate that the credit bureaus give you a free credit score with your free credit reports. However, Lexington Law Firm offers a free FICO credit score as well as a free credit repair consultation. You can get that by visiting their site or calling 1 (800) 220-0084. There are also several credit card companies that offer a free credit report. You can often order your credit score alongside your free credit report for an additional fee as well from the credit bureaus. However, these scores are considered FAKOs as they are not real FICO credit scores (the scores that lenders use). While the VantageScore (the credit score created by the credit bureaus to compete with Fair Isaac) is used by some businesses and institutions, the vast majority still rely on FICO scores to make credit decisions. So before you pay for any credit score, make sure that it’s one that will be useful to you. If you want to monitor your credit reports and credit scores monthly, you might want to consider a credit monitoring service. Can I get more than one free credit report per year? How can I dispute inaccurate information on my credit report? If you find inaccurate or “questionable” information on your credit report, you can dispute the errors with the credit bureaus. We also offer free credit repair letters or if you need help getting rid of negative items on your credit reports, you can hire a credit repair service. What Is a “Derogatory” Mark on Your Credit Report?